Cambodia can be a hard sell, but Rithy Sear relishes the challenge. When he courts potential business partners from overseas, he listens to their worries about the small size of the market, the flourishing trade in smuggled goods, the corruption. And once they’re done, he begins working tirelessly to reshape their opinions. Sear’s negotiating advantages are preparation and confidence. He usually doesn’t meet investors in his office. That’s a cluttered, temporary suite in the Phnom Penh headquarters of his Worldbridge International, his logistics, property and investment company. Instead, he chooses the exclusive business lounge on the 12th floor of the Sofitel Hotel, where the floor-to-ceiling windows lead your eyes to The Bridge, his gleaming 45-storey hotel, retail and condominium complex that will be completed by the end of the year. That’s where he’ll present his argument. Global security company Brink’s got this treatment. It already was a customer of Sear’s logistics company, transporting Tiffany & Co jewellery to Cambodia. But Sear figured that Brink’s could increase its local revenue eightfold if it worked with WorldBridge on offering more services in the country. When it hesitated, the hard-charging entrepreneur says he began a full-court press, flying to any Southeast Asian country that a Brink’s executive happened to be visiting until it signed a joint venture agreement in July. Singapore, in particular, has been an inspiration for Sear, and Singapore property-development group Oxley Holdings his biggest partner. The Oxley Worldbridge joint venture is building The Bridge and has already sold all of its condos. That persuaded Oxley’s executive chairman and chief executive, Ching Chiat Kwong, to commit to building two more Phnom Penh projects. 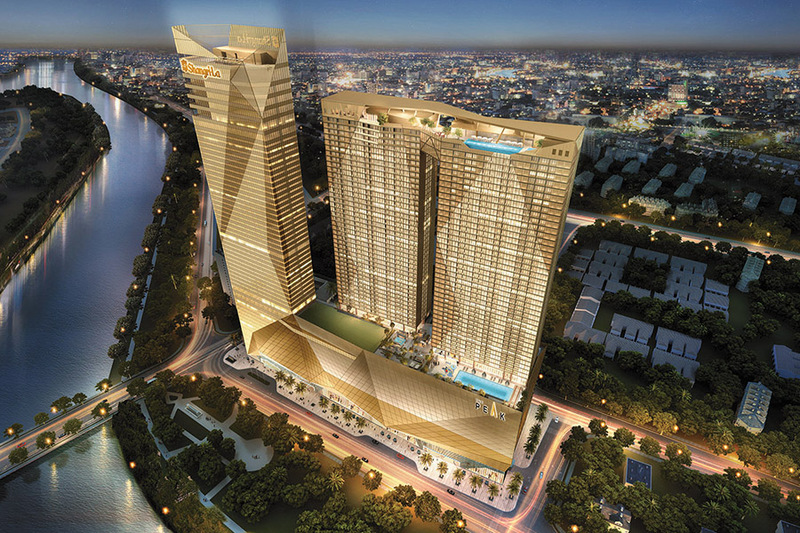 Next is The Peak, a $580 million complex of three 55-storey towers that includes a 300-room Shangri-La hotel expected to be finished in 2020, and then The Palms, a $100 million luxury riverside community. Homes will start at $350,000, and this in a country where per capita gross national income is just above $1,000 a year. At the Oxley WorldBridge showroom in central Phnom Penh, Sear seems to concede that he had to hire foreign design and construction firms because local companies aren’t yet able to build 45- and 55-storey towers. But he lauds the designs as his own ideas, declaring that the silver and gold skyscrapers of The Bridge and The Peak could blend into Singapore’s skyline. 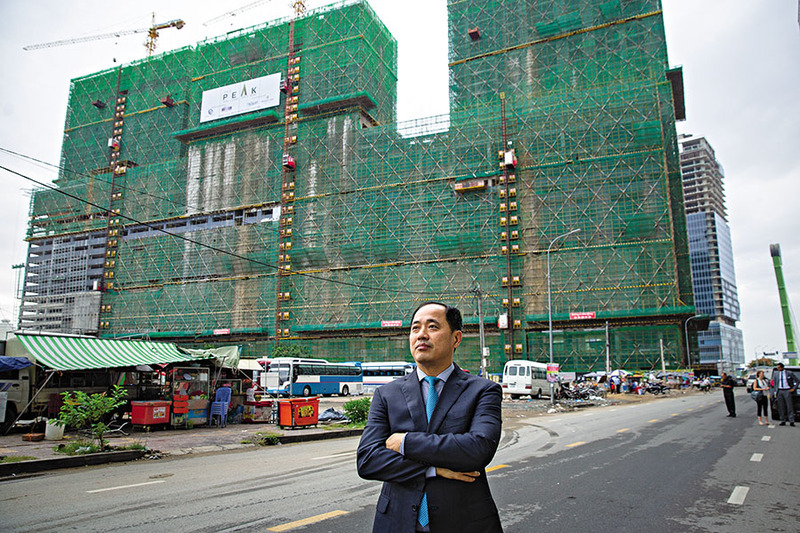 For his part, Ching says he was surprised by the young, bustling population of Phnom Penh. He quickly signed on after meeting Sear, and now calls Cambodia one of his best-performing overseas investments. The glitzy real estate developments grab lots of attention, but the foundation of WorldBridge is the logistics company, which Sear started as a delivery service in the 1990s and then expanded into import/export and outsourcing services. It boasts 3,750 employees, including some in Vietnam, Laos, Thailand and Myanmar, and lists more than 200 multinational customers. Sear says he’s a billionaire, and that well may be, but Forbes Asia cannot verify this. He bases that claim largely on the value of the 7.5 million square metres of land around the country that he says he’s purchased over more than two decades, but he declines to provide property records. He also says he owns 100 percent of privately held WorldBridge, along with a 50 percent stake in Oxley Worldbridge and 40 percent of Kerry Worldbridge Logistics, a joint venture with Hong Kong’s Kerry Logistics Network that provides logistics, freight forwarding and supply-chain support. He says his companies and joint ventures generated $1.3 billion in revenue last year, with the property business accounting for 60 percent of that. But he declines to provide net-profit figures and other financial results. Corruption is seen as endemic in Cambodia—the country ranks near the bottom of the 180 countries on Transparency International’s Corruption Perception Index—and it sours foreign investors’ stomachs even faster than prahok, the country’s traditional fermented fish. But Sear says he doesn’t pay bribes to customs officers to move cargo or hide a shipment’s contents, and customs officials and observers agree that he’s clean. He instils confidence in customers by complying with the government’s Best Traders Scheme, which promotes clean, prompt and inexpensive transfers of cargo at the borders. He is an oknha, a title given to anyone who’s donated at least $500,000 to the government for public projects. It gives him access to Prime Minister Hun Sen, but he says he advises on entrepreneurial matters rather than lobby for particular policies. Cambodian tycoons often benefit from ties to the prime minister and his family, but there’s no evidence that Sear’s businesses have received any special favours. Sear didn’t become rich and successful without having an eye for a deal. When French antique dealer Beatrix Dayde Latham left Cambodia and a home filled with Ming Dynasty antiques, Sear bought it and all the antiques for just $2.65 million on the promise he’d preserve the lavish custom construction. But he doesn’t stay in the museum-like villa because its southern-facing construction violates the principles of feng shui. He visits the property only to host and impress ambassadors, or fish from its prime location along the Mekong River. Few tycoons grew up poorer or suffered more adversity than Sear. Born into a Chinese Khmer family in Phnom Penh, the third of five children, his family was forced to abandon their home and their auto-mechanic business in 1975 under the Khmer Rouge. They ended up in the regime’s work camps, where families were made to grow rice. His mother’s role as a cook in the camps allowed her to save morsels for her family, wrapped and submerged in the water tanks she carried at the end of the day. Despite the cadres’ slaughter of ethnic-Chinese citizens, everyone in Sear’s family survived, but the hardships did not end with the regime’s fall in 1978. With a gift for learning languages, Sear furtively picked up English from a Russian embassy worker, which was illegal under the country’s then-Vietnamese control. But the skill was highly valued as the US and UN began slipping support into Cambodia, so in 1988 his mother arranged his passage on a refugee boat to Australia so he could offer his services as a translator and seek aid.